After the page jump, a before and after view from the development’s gate. 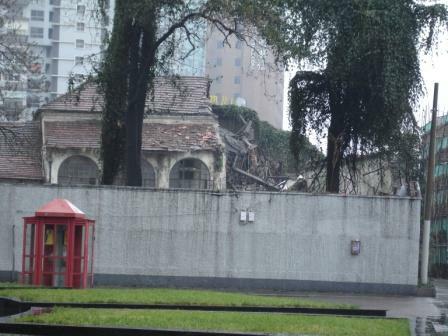 First, the convent as it was being disassembled and demolished in January 2009. And, as of this past weekend: the new, improved, down-scaled (by 20%) replica circa 1880s Carmelite convent. Photo taken from the exact same vantage point. Note: I realize that a guard in a helmet and uniform is a bit of a loaded image, but trust me when I say that I could not get him to move out of the way. What will the developer do with his new convent? Well it just so happens there’s another historic Catholic convent building just two blocks away. 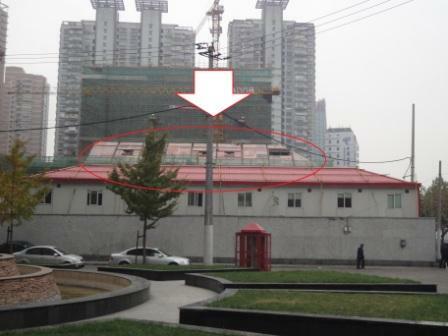 That one still stands, and still belongs to the Church … but because it’s so large, and the Shanghai Catholic diocese’s community of nuns is so small, it’s been rented out and now functions as a railroad-themed restaurant, complete with actual dining cars. That is no disrespect to the Shanghai diocese, which has admirably chosen to maintain the building rather than authorize it for demolition in favor of a much more lucrative high-rise development, but rather to point out that it’s not exactly easy to figure out what to do with these buildings once someone decides to preserve them. So, for the record: I’m aware of that, and I just wish somebody had had a little more imagination and sense before setting the wrecking ball loose on the Carmelite Convent of Xujiahui. This entry was posted in Architecture, Catholicism, Shanghai History by Adam. Bookmark the permalink. That demolition was criminal – literally. The nunnery was a grade A preserved building, illegal to so much as change out the windows, let alone demolish the thing. 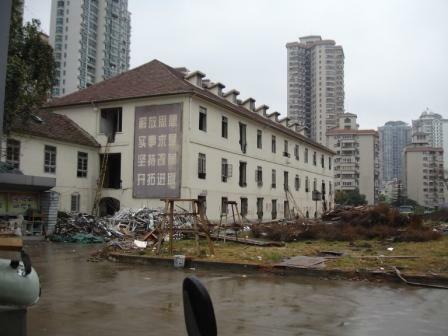 The Xuhui District government (which has a commendable commitment to history, culture and preservation) vociferously protested the demolition, but were ignored: the developers, and their backers the Shanghai Film Group and who knows who else, had more powerful connections than even the district. Letters and essays that district officials and many academics sent into local media were “harmonized”, even at publications where they had close relationships with the head editors. My money is on the new building being turned into a clubhouse for the residents, at least until they sell most of the units. Sometime between when the units sell, and when construction and renovations finish and people start moving in, they will quietly convert into a luxury store or F&B venue. That, or re-demolish it to build another tower. Thanks, Lisa. Great, helpful comment. Speaking of criminal acts, did you see how they demolished the old house that used to belong to House of Blues & Jazz on Maoming and Fuxing??? I’ve lived around Xinhua Road for a few years and that’s exactly the pattern. A developer gets hold of a listed building where they have to at least make a commitment to preserving the outward look. Then they utterly demolish it save for a barn style a-frame and build a replica in it’s place. The most recent high profile example of this was the old family home of J G Ballard on Panyu Lu #508. I wrote a bunch of stuff about it and photographed it a couple of years back. Then last year it changed hands and the new owners destroyed it utterly and built a replica from scratch. Its odd to me, if you are going to build a replica, why not keep the original exterior or restore it? I guess it’s cheaper? Anyway, it’s all over now. I understand and agree with the sentiments expressed that its sad to see the steady loss of historic structures. Not only for the buildings themselves, but for the stories they tell, or rather told. There is an obvious difference of cultural values here. In the US, we devote quite lot of energy sharing the stories of our history. One example is the San Antonio Missions National Historic Park. Its both a national park site and an active parish where you can attend a mariachi mass Sunday morning and then take a ranger-led tour, through the grounds maintained by an entire team of highly trained historic preservation specialists. See http://www.nps.gov/saan. 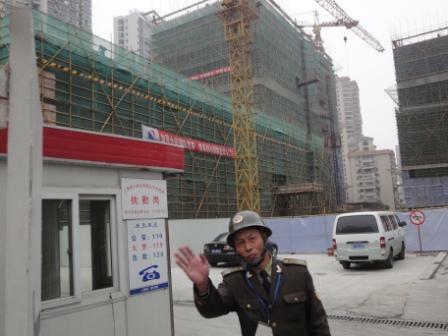 Does China have somewhere that trains historic preservationists? We have lots of these places that support our historic preservation values, and teach the hands-on skills to maintain them – http://www.nps.gov/training/hptc/.